Environmental stewardship is a part of the culture of H. J. Oldenkamp. We recognize our ongoing responsibility to be good corporate citizens and stewards of the environment. As part of this ongoing commitment, we maintain policies and practices to ensure we are a leader in the industry and in environmental stewardship. H.J. Oldenkamp Company has embraced the green movement with many eco-friendly enhancements to our own warehouse facility. H.J. Oldenkamp Company has embraced the green movement with many eco-friendly enhancements to our new warehouse facility. This new high output, low power consumption lighting gives us significantly more light, with about one-third the number of fixtures, while at the same time cutting our current power consumption by almost half. In addition to the efficient lighting, we have taken additional steps to reduce our carbon footprint by adding motion sensor controls to all of our interior lighting. This provides more strategic lighting to areas that we occupy while keeping unoccupied areas unlit. On almost half of our roof surfaces, we have more than doubled the amount of insulation, increasing our R-factor rating to above minimum code requirements. In conjunction with insulating, we have used industry leading materials that are manufactured here, in Michigan, to create a reflective surface that aids in both the heating and cooling of the facility. We are always looking for fiscally responsible ways to do our part to help keep the earth a greener place. Arborite Laminates – All Arborite Laminates are GREENGUARD Indoor Air Quality Certified. For you, this means that all Arborite products are guaranteed low-emissions materials designed to protect the environment and those around you. ATI Decorative & Specialty Laminates – ATI’s MirroFlex™ EccoFlex™ is manufactured with 40 – 50% pre-consumer recycled material. ATI’s NuMetal™ is manufactured using 100% rapidly renewable materials and is phenol-free and is a low-emitting formaldehyde product with less than 0.01PPM. NuMetal™ is certified to (EN DIN 717/1) exceeding the emissions thresholds of CARB’s Airborne Toxic Control Measure (ATCM) phase 1&2. 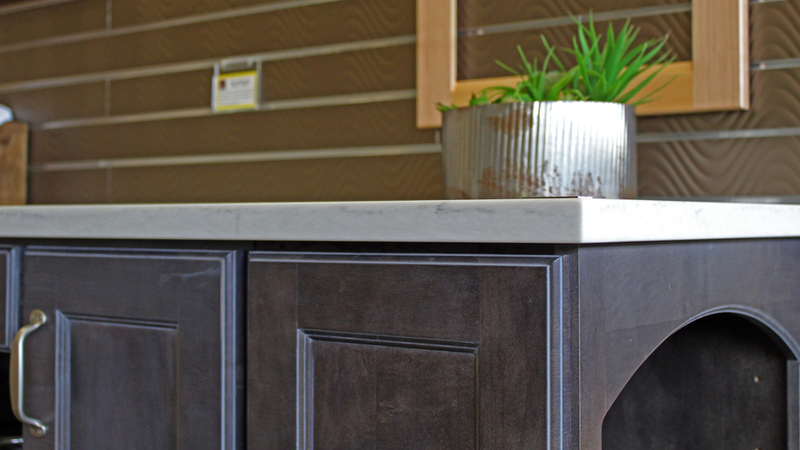 Corian® Solid Surface Terra Collection – Made with pre-consumer recycled content. In addition to GREENGUARD® certifications, the Corian® Solid Surface Terra Collection has been certified by Scientific Certification Systems to contain at least 6% – 13% pre-consumer recycled content, including some colors that contain at least 20%. The Terra Collection may help contribute towards U.S. Green Building Council LEED® points for Materials and Resources (MR) Building Reuse, MR Regional Materials, Environmental Quality (EQ) Low Emitting Materials – Adhesives and Sealants. In addition, DuPont has achieved zero landfill status in its Building Innovations business by reducing, reusing and recycling manufacturing by-products and waste at manufacturing sites globally. Corian® Quartz Terra Collection – This collection may contribute to earning points under the LEED® Building Rating System™ developed by the U.S. Green Building Council (USGBC). The Terra Collection received the NAHB Green Award due to its post-consumer recycled content, qualifying builders for up to 2 points toward certification to the National Green Building Standard™. All Corian® Quartz colors have been certified by GreenGuard® for low VOC emissions. Masco Cabinetry – Merillat® & QualityCabinets® – Masco Cabinetry LLC is proud to demonstrate its commitment to environmental sustainability through certification administered by the KCMA. All Masco Cabinetry facilities have also obtained ISO 14001 certificate of approval, demonstrating a commitment to reducing the impact of operations on the environment. Michigan Maple Butcher Block – The environment is an important consideration for Michigan Maple Block Company and Bally Block Company. Wood, being their business makes them acutely aware of issues regarding forestry and the health of the planet in general. The company’s decision to produce Wood Welded Butcher Block from Lyptus was heavily influenced by these factors. Lyptus is considered a “Green” product and is grown on plantations. This method of forestry more closely resembles farming than some forms of commercial logging.